I made these 'Talam Serimuka Telang' sometime back when I hosted a Nasi Lemak Lunch Party for a few good friends. I cut them into random shapes and serve them on a plate with a Pandan leaf on it, just so they get the idea of what goes in and what's Pandan. I tinted the glutinous rice with Bunga Telang given by Sonia. The original recipe was from the book 'Steamed Cakes' by Zubaidah Bt. Chepa. I got it when I was in Malaysia. It's called 'Talam Serimuka Batik' where the author uses a mixture of black and white glutinous rice but I decided to go blue naturally. Wash the glutinous rice under running water tap until no longer cloudy. Mix water with Bunga Telang and rub and squeeze it to extract a deep dark blue hue. Strain it and mix the water with the glutinous rice and soak it overnight. Drain it well and mix it with the coconut cream and salt. Pour into a greased pan and place the knotted Pandan leaves over and steam it over high heat for 25 minutes. Mix all the ingredients for custard in a bowl and strain it once. When the rice is done, fluff it up with a fork and compress it into a greased pan (I use the same pan). Use a banana leaves or a glass covered with foil to compress well. Pour over the strained custard and cover the whole pan with foil tightly. Steam it over medium-low heat for 30 minutes. Cool completely before slicing into diamonds or triangles. The book traced it out with a flower shaped cookie cutter but make sure you oil your cutter well. And use a plastic knife, lightly greased to slice them. It helps in getting neat cuts and they don't stick to the plastic knife. This is a typical Malaysian Style Kuih you could easily get from wet markets. The Bunga Telang is solely optional but it does lend a nice fragrant to the rice. The Pandan leaves and paste was my addition but the book didn't say you need it. If your custard has bubbles in it, use a blow torch and run it across the surface and the bubbles will all magically disappear. Try making it, it's easy and looks fantastic! 13 comments on "Talam Serimuka Telang"
Lovely-looking kuih. nothing like natural stuff. Clitoria ternatea or butterfly blue pea flowers are popular with the nonyas. My Mum-in-law used to sun-dry them and use them in kuihs. i am too lazy and i use colouring. This is beautiful and looks so yummy. Anyway Quinn, if you still have the dried Bunga Telang, you can just stuff it into a pot of soil and its can grow easily. Wow these look so fun!! Despite me not liking coconut milk, I love this kueh. Quinn, this is beautiful, good idea to have the rice with all blue but not part of it. Oh, this looks great. My hubby's favourite seri muka. I'll try this with blue too, next time when I plant my own flowes. Thanks all for the very much appreciated comments and views. Zurin: Yeah, when it comes to kuiha nd glutinous rice stuffs, nothing beats a plastic knife, you know those cheapo that comes with birthday cakes? Works beautifully! Anncoo: It's dried and I still don't quite get it how on earth is it going to grow???? Gert: Did you plant with the dried bunga telang that Sonia gave us??? Sonia: Thanks! I usually do part blue and part white in Pulut Tai Tai and Rempah Udang but for this instance, I just wanted to do all blue and see how it'll look like! Elin: Awwww Elin, can't say that. You're such a great cook/mum and everything great! Your stews and pasta, they're all so easy to follow. 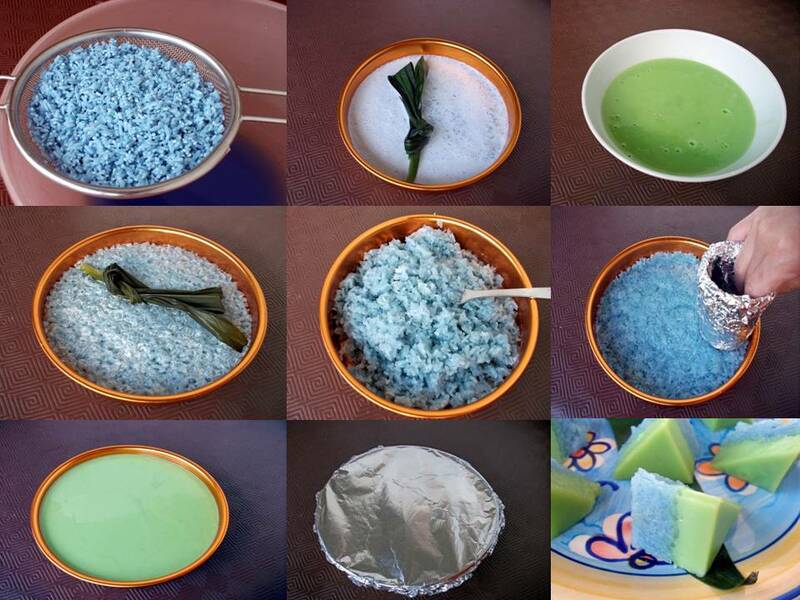 You can make kuih, they're easy. Must try and have faith!! !